This paper gives a brief description of several models of the motion of dislocation lines in the simulation region: the principal model of dislocation multiplication of the Frank — Read type and models developed on its basis. The latter include models of a single dislocation motion, multiplication and motion of an ensemble of dislocations, formation of a dislocation pile-up. The paper presents the main results obtained on the basis of these models: the curve of deformation under constant uniaxial loading; the curve of deformation at a constant rate of deformation; the curve of dependence of the number of dislocations in a pile-up on the value of the external applied stress. 1. Friedel, J. Dislocations. 1972, Moscow: Mir. 2. Hirth, J.P., & Lothe, J. Theory of Dislocations. 1972, Moscow: Atomizdat. амплитудно-зависимого внутреннего трения]. FMM, 1988, 65(2), 259–267. и источника Франка–Рида]. FTT, 1968, 10, 1760–1768. трехмерном дислокационном ансамбле]. FTT, 1970, 12(7), 1729–1733. FCC metals. 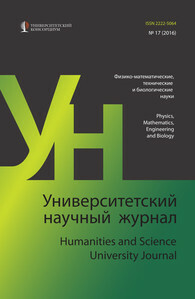 Russian Physics Journal, 2006, 49(1), 62–73. дислокационного источника Франка–Рида. I. Начальная стадия работы источника]. Physics of the condensed state, 1974, FTINT, Kharkov, Iss. 33, pp. 44–57. Simul. Mater. Sci. Eng., 2004, 12(1), 159–196. State Technological University, Kostroma). 2001.
источника Франка–Рида]. Vychislitelnye tekhnologii, 2008, 13(5), 5–10. line. The Physics of Metals and Metallography, 2009, 108(2), 212–215. Physics of Metals and Metallography, 2010, 109(3), 286–288. и сплавов]. 1983, Moscow: Metallurgiya.